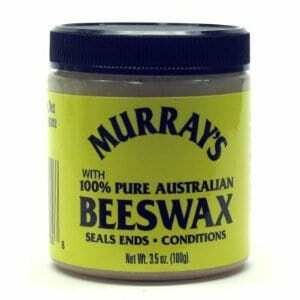 Beeswax is a great alternative to hair moisturizers and conditioners for men. There are lots of benefits of beeswax we are not aware of. Not only is it great for sealing in moisture, but it also adds shine and protects each strand from the damage of external elements such as heat and dust. It comes from bees and is an important component in the creation of honeycombs. Most stores carry pure beeswax in formulations that make it easy to apply on men’s hair and most formulations come in small tubs and are very affordable. Men will love the light, odor-free nature of beeswax. The wax is light, does not have any overpowering smell, and is very easy to use on the hair for styling purposes. It contains antioxidants which help protect the hair from the damage of pollution and heat. It also contains natural moisturizing properties that make it perfect for preventing frizz and dryness. Men who want to create a hairstyle that will last until the end of the day without using creams or gels that contain alcohol or mineral oil will love the versatility of beeswax. And because it does not contain synthetic oils, it keeps the hair light and will not block the pores on each strand, allowing the hair to breathe. It also moisturizes the scalp while allowing the scalp surface to breathe, unlike synthetic hair products that create a barrier on the scalp surface. Beeswax is the preferred product of choice for men with dreadlocks and for men who want something natural that they can use for styling their hair. Beeswax is added to the hair after the dreads are in place and is used to smooth each lock so that it is well-defined, clean, and moisturized. A pea-sized amount of wax is good for each lock. It is best to melt the wax by rubbing between the palms before applying so that it goes on more evenly. The use of it on dreadlocks has been shown to reduce the amount of dirt and grime that sticks onto the strands and the scalp and helps keep the hair shiny and soft. For men who want a more natural hairstyle, they can smooth a small amount of the wax onto each strand and style as desired. Contrary to popular belief, beeswax has amazing staying power and will keep the style in place for several hours. The hair remains soft yet styled. This is a great alternative to styling products that give the hair a hard, coarse texture. It is easy to create textured yet naturally soft styles with the wax. The wax is also good for creating long, flowing locks for men with shoulder-length hair. It is important to rub the wax from the root to the tip to ensure that the style stays in place. Beeswax is a great natural alternative to synthetic hair styling products that dry out the hair and give the hair a heavy, greasy feel. Natural and full of antioxidants, it helps retain the natural moisture of the hair and prevents free radical damage brought by pollution and heat.